This pattern involves basic sweater construction, and a simple lace pattern that is repetitive enough to memorize. Pattern inspiration: I saw a top like this on Target.com, and just had to knit up my own version. 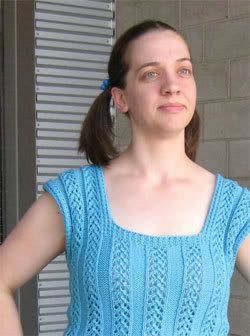 I think this design is classic and timeless and has so much potential to be knit all different kinds of yarns. The Modified Lace Rib Panel stitch is very stretchy. The finished garment will look best with 1 inch of ease or less, or even a small amount of negative ease. The sample is shown on a size medium model. [MC] Knit Picks Main Line [75% pima cotton/25% merino wool; 82 yd per 50g skein]; Color: Wedgewood; 6 [7, 8, 10, 11, 12] skeins. A cotton/wool blend is perfect for this top, since cotton is cool and comfortable for the summer and a little bit of wool helps it hold its shape. 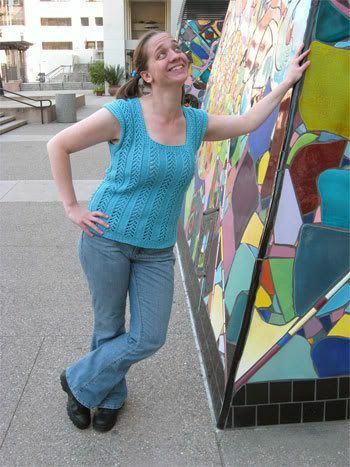 Almost any worsted weight yarn could work for this top, as long as it retains its shape and some elasticity. Row 2: p1, *k1, p1; rep from * to end. Row 1 (RS): p1, k5. Row 2: p1, *k1, p1; rep from * once to last st, end k1. Row 1 (RS): *k1, yo, sl 1, k1, psso, k1, k2tog, yo, k1, p5*; rep from * to last 7 sts, end k1, yo, sl 1, k1, psso, k1, k2tog, yo, k1. Row 2: *p7, k5; rep from * to last 7 sts, end p7. Row 3: *k2, yo, sl 1, k2tog, psso, yo, k2, p5; rep from * to last 7 sts, end k2, yo, sl 1, k2tog, psso, yo, k2. CO 71 [79, 89, 97, 107, 115] sts. Work in Broken Rib for 1.5 inches, ending on WS row. Next row (RS): p2 [6, 5, 3, 2, 6], work Row 1 of Modified Lace Rib Panel, end p2 [6, 5, 3, 2, 6], Next row (WS): k2 [6, 5, 3, 2, 6], work Row s2 of Modified Lace Rib Panel, end k2 [6, 5, 3, 2, 6], Work even in patt until piece meas 13 [13.5, 13.5, 14, 14, 14.5] inches, ending on a WS row. At beg of next row (RS), CO 6 sts using the knitted cast-on method, work Row 1 of Modified Broken Rib over these 6 sts, and work rest of row in patt as set. At beg of next row (WS), CO 6 sts using the knitted cast on method, work Row 2 of Modified Broken Rib over these 6 sts, work in patt to last 6 sts, work Row 2 of Modified Rib patt to end. (83 [91, 101, 109, 119, 127) sts]. Work even in patt as set, maint Broken Rib patt over first and last 6 sts of each row, until piece meas 17.75 [18.25, 18.25, 18.75, 18.75, 19.25] inches from CO, ending on a WS row. Next row (RS): Work 27 [31, 30, 33, 39, 43] sts in patt as set, work Row 1 of Broken Rib patt over next 29 [29, 41, 43, 41, 41] sts, and work rem 27 [31, 30, 33, 39, 43] sts in patt as set. Work even for 1 inch, ending on a WS row. Next row (RS): Work 29 [32, 35, 38, 42, 45] sts in patt and place on holder, BO 25 [27, 31, 33, 35, 37] sts for Neck, work rest of row in pattern. Left Shoulder only: Work even in patt as set over 29 [32, 35, 38, 42, 45] sts until armhole meas 8.25 [8.75, 9.25, 9.75, 10.25, 10.75] inches. BO. Work Right Shoulder in the same manner. <?xml:namespace prefix = o ns = "urn:schemas-microsoft-com:office:office" />Work as for back, beginning neckline shaping as written for Back when work meas 15.25 inches. Seam shoulders. Seam sides. Weave in ends. Block.